I think it's a trend with MMU places, that as they shift focus or repurpose or close down, any released items are a little more sheer than previous colors. 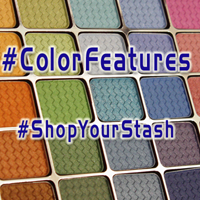 I noticed that over Aromaleigh v1's lifespan (the three years that I was aware of it) the “stock” collections were uniformly rich and pigmented - even the lighter shades - where the later collections were not quite as solid. The Mythos colltection colors aren't exactly sheer, but they're not as deep and rich as earlier-released pigments from Aromaleigh. Athena is no exception. 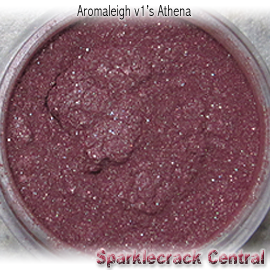 It's got the rich red-wine coloring of <a href=”/such/obsessive/addictions/aromaleigh_v1s_raisin/”>Raisin</a> (from the Pure Eyes Frost collection) with more of a multicolored shimmer finish and a little less color payoff.